The legacy of the Giant Spectacular, one of Liverpool’s cultural highlights of 2012, continues. No man, woman or child who witnessed the sight of the giants making their way through the city will ever forget the experience. 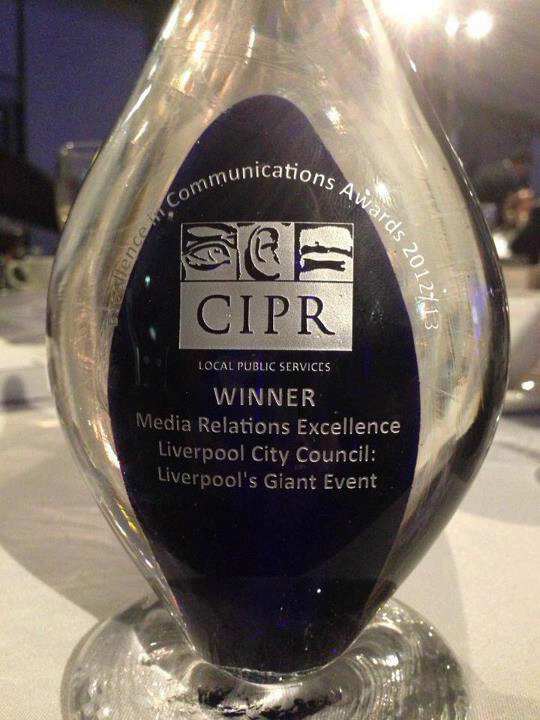 And now the magnificent team from Liverpool City Council that did the publicity for the event – the biggest the city has ever seen – has won a prestigious industry award, the CIPR award for Media Relations Excellence. And well deserved it is, too. Working on a paltry council budget, Sarah Langworthy and the team were creative and inventive in embracing social media in the run up to the event, drip feeding snippets of information and clips of what was to come. The event was publicised around the world and bought in an incredible 800,000 visitors (they’d planned for 250,000). Of the visitors who came, 50% were from outside the city and 6% were from overseas; an amazing achievement. And I’m sure it was worth the trip. The Guardian gave the event a very rare 5 star review and the response from media worldwide was overwhelmingly positive. An independent review estimated the economic impact of the event at £32m to the city’s economy. Not small potatoes in anyone’s book. It’s that time of year when we look back on the last twelve months and look forward to the year ahead. As we scrape away the last of the turkey, think about what we’re doing for New Year’s eve and contemplate going back to work, I thought it would be good to look back at this year’s highlights. And, man, have there been some! I’m aware that I’ve become a bit of a broken record when I say that this year and being made a Cultural Champion has changed my life, but you don’t have to be an official champion to change yours. You just need to put yourself out there. I promise you it will pay bigger dividends than you ever imagined. So, in the spirit of end of year lists, which I love to an unnecessary degree, here are my Top 12 highlights of 2012. I can’t wait to see what the coming year will hold. What about you? My very first venture into the arts in Liverpool could not have been more of a revelation. Nervous as hell and overwhelmed with information, I thought I’d start off with something small and intimate. This gallery and its artists have become one of my absolute favourites over the year. Set in the Baltic triangle, it’s well worth a visit. Great exhibits, a fantastic bar below and lovely, lovely people. One of the best things I’ve done is to have some time with my children without spending a bomb. We packed sandwiches, braved the lovely British weather and Liverpool’s public transport network and, boy, did we have a great time. It takes some planning and we still never had a picnic in a sun drenched meadow, but we had some great times together, giggled like mad and my kids loved it. John, Ray and I along with Ray’s wife, Pauline, and my favourite plus one, Vickie, headed out into the very, very rainy streets of Liverpool for Light Night in May. We saw the city lit up in all its architectural glory, we made our own art, encountered a zombie street takeover, met Andy Warhol (!) and saw a rain-drenched group of salsa dancers bringing some Brazilian style magic to the street. An absolute gem of a night. The standard of productions at The Playhouse in 2012 has been consistently superb. A close second here was A Streetcar Named Desire, featuring the most heartbreaking performance I’ve ever witnessed by Amanda Drew. There was also the innovative and excellent Swallows and Amazons as well as Jack & The Beanstalk, possibly the most bonkers panto I ever laid eyes on. It was so mad, that by the time Captain Spock and Wonder Woman flew on stage, I’d given up trying to make sense of it and just enjoyed the ride.But it was Henry V, which wins my prize for being the best play I’ve seen all year. It completely changed my 20-odd-year-old mindset that traditional versions of Shakespeare plays are generally tedious and fol-de-rol. It was lively, moving and beautifully acted. I urged everyone I knew to go and see it and every single person who went loved it. A great introduction to the bard and a perfect demonstration of why his work is still relevant today. On a bright and beautiful Friday morning in April I sat among a sea of volunteers in Stanley Park waiting to accompany the giants through our city. 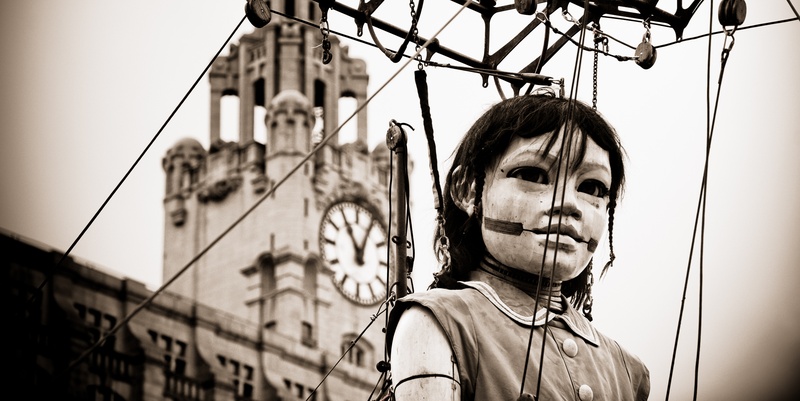 We watched in awe as the Little Girl Giant and her dog, Xolo, woke up and got ready to walk into Liverpool city centre to meet her long lost Uncle. As we escorted the Giants through the streets of Anfield I witnessed actual magic happen before my eyes. No-one who saw the giants was not caught up by the magic. Whole groups of people, some of whom may never have set foot in a theatre or art gallery, thronged the streets to become part of this wondrous event. I escorted the Giant Uncle back to Stanley Park in the afternoon with my fellow Benevols, a particularly marvellous group of people. We watched in awe as a group of exotic, athletic, sweaty French men and women operated (or should I say “served”?) the giants. I went home with one of the worst migraines I ever had, having walked next to an enormous bank of speakers for hours on end, but it was worth every bit of pain. The Sea Odyssey will never be forgotten by anyone who saw it. Brilliant. I’ve discovered some great little venues in the city over the last year. But the Kazimier Garden wins first prize hands down for the best night I’ve had all year. Featuring a barbecue, two outdoor bars, a man sporting a bird of prey playing the role of MC, a tiny mechanical boat and the ropiest toilets I’ve encountered in a long time, by the time the house krunk band came on and blasted the place with the sound of drums and trumpets, I was in love. Like taking a trip through the looking glass, it’s a shock when you leave and find yourself still in urban Liverpool. A total delight of a place. “What?” I hear you exclaim. Considering just how much I’ve banged on about how much I hate the Mathew Street Festival and its awful culture of drunken unpleasantness, you might well wonder why it’s here in my list of highlights of the year. Well, I’ll tell you. I gave it a go. I tried something. And I found, to my genuine surprise, that hidden among a whole bunch of awfulness, you can find something pretty special. We discovered a little oasis of family friendliness in St John’s Garden and we rocked up on a boat that was part of the Mathew Street Fringe that was reminiscent of early 90s raves. Just goes to show it’s well worth putting yourself out there, because you never know what could happen. It started off with a t-shirt. I’d had some made for John, Ray and I as we were taking part in the Guinness World Record attempt at the most people singing a song in the round at the new cruise liner terminal in October. I was dropping John’s t-shirt off at the time he was filming for The One Show with the gorgeous and luminescent Carrie Grant. John was launching “The Fifth Beatle” – his dream of getting people who hadn’t played an instrument for years to play again. John, Carrie and a rather dishy BBC director harangued me into being a backing singer. Now let me tell you, I am by no stretch of the imagination a singer. No way. Not a chance. But egged on by an extremely excitable Johny, I took the rest of the day off work and ended up performing John and Carrie’s beatuful arrangement of ELO’s Livin’ Thing live on the BBC with a bunch of genuinely talented people in Eric’s. I was as nervous as I’ve ever been, but I wanted to show my kids that even if you’re seriously afraid of something, you can still do it. And now I can say I’ve performed on the same stage as U2, The Buzzcocks, The Stranglers, Joy Division and a whole host of my musical heroes. One to tell the grandkids. At a time when Liverpool City Council is fighting economic misery, this was a great example of getting it just right. This series of free concerts at the Pier Head showed that if you invest in the arts, it will bring people and money into the city. With an eclectic, but high class, mix of performers, my personal highlight was seeing the magnificent Jocelyn Brown. I may have embarrassed myself my bopping about in a manner unseemly for a woman in her 40s, but it was a glorious night. And a great place to go with the whole family. This needs to be an annual event. I can’t single out a particular event I’ve seen at the Phil, the whole range of performances over the year have been fantastic. From the glorious old school movies, to contemporary comedians and 80s pop stars, the Phil has a knack of putting on great shows in a beautiful environment. Particularly brilliant have been the family concerts, arranged by the exuberant Alastair Molloy, and the so good you’ve got to see ’em to believe it Ukelele Orchestra of Great Britain. The variety of shows is so mind boggling, there’s something there for anyone, no matter what your taste. After being accused by my eldest child of hating all comedians, I belly laughed my way through this amazing show. Based on the results of a survey of over 10,000 men and women on the subject of, ahem, the male appendage, this had my sides and jaw aching with laughter. Richard Herring even stayed behind afterwards and gamely chatted to me about a question I had about the logistics of one of the answers to a question in the show. He did the actions and everything, bless him. Made me be prepared to give comedians another chance. I’m not the easiest person when it comes to making friends and meeting new people. But I’ve made a deliberate effort this year to be more open as I’ve gone about being a Cultural Champion. I’ve got in touch with people I know vaguely to invite them to events. I’ve stopped and chatted to strangers at events about what they think. I’ve emailed total strangers to ask them about what’s happening around the city. And it’s been a revelation! Everyone I’ve come across has been brilliant. The people I’ve encountered who are involved in the arts in Liverpool are across the board a warm and welcoming bunch. Sure, I’ve had a couple of loudly ignored emails, but in general everyone I’ve met or come across has been great. Getting out and about and experiencing culture in Liverpool has changed all of my relationships and I’ve met some new and fantastic people who I won’t be letting go of. It’s definitely the people I’ve been involved with who’ve made this year so, so special. I’m not going to get all teary Oscar winner, here, but you know who you are. So that was 2012. Can’t wait to see what 2013 has in store. 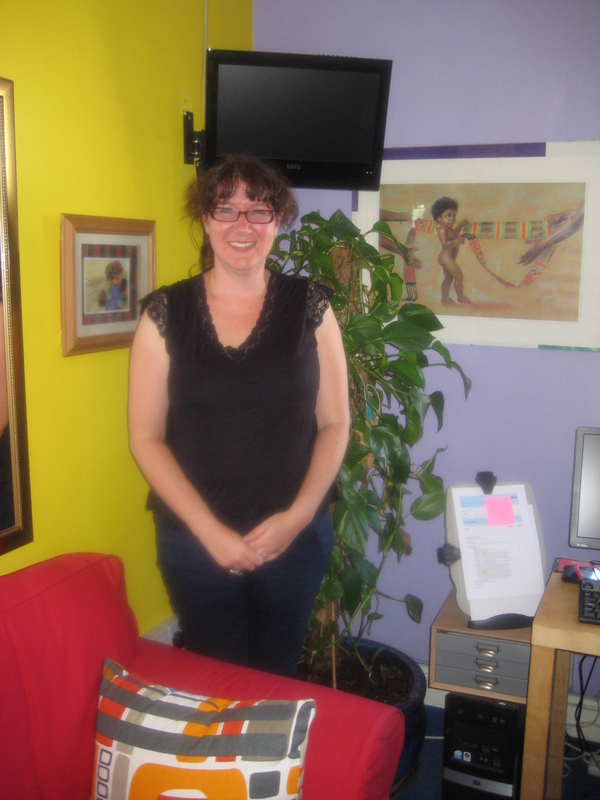 Cllr’ Claire Wilner- finally got that interview…. Liverpool based Councillor Claire Wilner-Assistant Cabinet member of Culture,Sport and Tourism, and Labour Councillor of Belle Vale, took time out of her busy schedule to have our long overdue discussion around her role as Political Mentor of the Five Cultural Champions, and her shared remit to continue raising the cultural profile of our region, locally, nationally and on a global scale. During our meeting, Claire demonstrated her passion and committment in supporting a broad spectrum of initiatives that fully utilizes the vast amount of agencies and resources focused on the Arts/Culture/Health and Well Being/Heritage Status of Liverpool/River Mersey and the Ferries/Parks and the Green Agenda to name a few. Pedalos in Sefton Park was launched the day before we met up, focusing on using our many wonderful park spaces and lakes. Claire also explained to me, that extending the involvement of communities outside of the City Centre was also an important aspect of her administration. Hotel occupancy was also discussed, and how mid-week numbers could possible be enhanced by the “Coach Friendly” award status held by Liverpool. In this decade of Health and Well-Being, Claire spoke of how important the health of our regions citizens, and addressing the key health indicators were crucial and directly linked to promoting a positive global image in terms of Brand Liverpool. The emphasis in also one of attracting additional revenue into the City through creative ventures both on a large-scale and smaller projects throughout the region. My eyes lit up when Cllr’ Wilner mentioned the proposal of a Liverpool equivalent of Ellis Island (New York) right here in Liverpool. Oh yes any mention of the River Mersey, our life blood, the tangible links with the history and migration of our City’s rich diverse communities, along with the wealth of culture,arts,heritage that makes Liverpool a prefered city of destination.. well she had my full attention! When asked what led her into her involvement with local politics, and her passion for her city, this was her response. Claire was gracious enough to share her journey from Manchester, her degree programme at our Liverpool JM University studying Countryside Management (Park Ranger), was very involved in student politics and went on to develop here interest in health promotion/mental health and her spiritual values. Claire took time away from Liverpool, and lived in Central Asia, Kyrgyzstan for five years, leant the language and returned to the UK having embraced all aspect of their culture,customs, values etc… Interestingly, Claire believes there is something that was already within her call it a “political gene” that stems from her Father’s political activities in Manchester. Claire’s enthusiasm for her community and their well-being on all levels was so infectious, and in our 45 minutes interview session, I gained a far better understanding of the many aspect of her role as Assistant Cabinet member of Culture,Sport and Tourism. What next beckons for your administration Claire, possibly that Cruise Liner route starting from our very own Cruise Terminal, sailing over to the Americas and Caribbean Islands? Saturday 11th August, Stanley Park got its own fleet of six pedaloes, part of a programme to attract more activities and families into the city’s parks and open spaces. The pedaloes are available for hire during the school holidays and at weekends. Thank goodness we were blessed with glorious sunshine.